John Kent Hitchings began in the alarm industry in XXXX. Always passionate about electronics, he decided to create his own alarm company based on providing higher quality burglar and fire alarm systems tailored to meet each customer's needs. 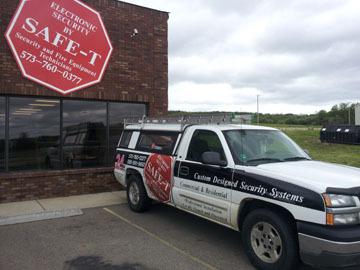 SAFE-T has been installing these security systems in the Southeast Missouri area since XXXX. Later, SAFE-T expanded along the security systems line, installing and servicing both residential and commercial alarms systems as well as CCTV, audio/video surveillance solutions and card access systems. We offer the personal service of a local alarm company, with the technology of a big company. SAFE-T also has certifications in Honeywell Total Connect, Vista Alarm Panels and GSM Communications. When comparing SAFE-T, we ask you to look at the areas we consider to be our strengths and decide what is important to you. - Locally owned and operated. If you have a question or problem with your alarm system, you can talk with the owner of the company at any time. We have a strong commitment to making sure you are happy because we live and work here as well. - Systems tailored to your exact needs. We customize your system to your needs. We do not make you fit the package; rather we build the package around you. - Trained and screened installers and customer service representatives. The installer that will be in your home or business have been carefully trained. They have been through background checks and drug screens. We want you to be comfortable with the person you invite into your home or business. We utilize training programs from our national association as well as consistent in-house schooling. We want our products to be installed properly to ensure optimum performance. - Licensed and insured. Do not run the risk of using a company that has not made the investment of insurance and licensing. This is your assurance that the company can stand behind their work. - Longetivy. SAFE-T has been in business since XXXX. Our track record proves that we do the job right and have been referred by happy customers. SAFE-T is commited to being a leader in the security and custom audio/video fields by providing high quality equipment coupled with excellent service and installation practices. We aim to present the latest technology coupled with ease of use and practicality for day-to-day operations. We carefully select and train our staff to consist of knowledgeable installers, salespersons and customer service representatives who will assist our customers at every step of their interaction with SAFE-T. Our products are geared to making living safer, easier, more comfortable and enjoyable. SAFE-T prides itself on keeping up with the security system trends and technology to give you the best and most up to date products. When installing a system, whether it is an alarm, security camera or DVR, we try to look ahead and make sure that your investment will not be outdated quickly and suits your needs. We carefully select the products and vendors we deal with to make sure their products have an eye on the future trends. At the same time, we are committed to watching for the latest developments in the industry and regularly attend trade shows and training seminars. We see our industry evolving towards consolidation of our different product lines. We are striving to be the "low voltage specialists" now and in the years ahead.